The website has a link to a simplified version. We tried both the simplified and the original version and found the original version is better. The original recipe lists a number of ingredient choices so we figured we would tell you exactly what we used to create the loaf you see in the picture. For the oil, we used canola. For the liquid, we used cow’s milk heated slightly in the microwave. For the flours, we used sorghum for the first choice, quinoa for the second, and teff for the third. According to Kim, you can use rice flour instead of teff but she doesn’t recommend it saying that it leaves the bread with a rice flour taste. Believe her. We couldn’t find teff so we tried it with rice flour first and yes we could taste it. We also found the texture better with teff. We used our Cuisinart bread machine and set it for gluten free bread, a 1.5 pound loaf, and a medium crust. We also brushed the top of the loaf with melted butter and sprinkled it with salt when it was finished rising and about to bake. Can’t wait to try this with some of the other flours and add ins that Kim lists. 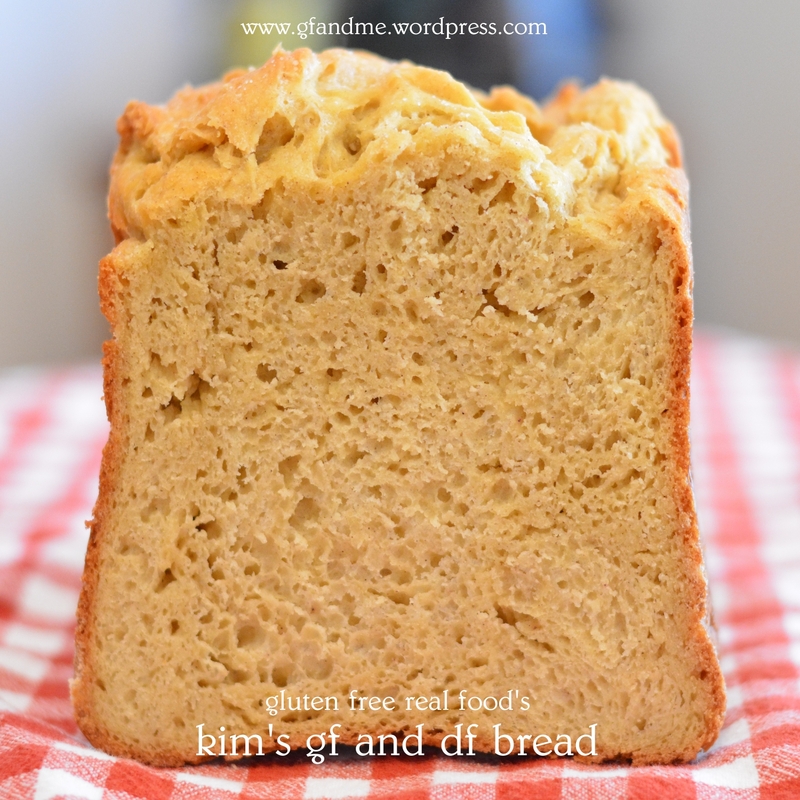 Find the recipe for Gluten Free Real Food’s “Kim’s GF, DF Whole Grain Bread” here. This entry was posted in Baking, Recipes and tagged bread, bread machine, celiac, dairy free, df, GF, gluten free, gluten free in Red Deer, recipe, sandwich, soft gluten free bread. Bookmark the permalink. Anything with teff has got to be a winning formula. How great that it is also non-dairy. Love this! I get my teff at Whole Foods, by the way. You can make the flour by grinding the teff in the Cuisinart. Thanks! That’s my new theme (background). Thanks! It is really good. Do you have advice for kneading the dough if one does not own a bread maker? Here is what Kim has to say on her site about baking this without a bread maker: “I put the first 6 ingredients in the bowl of my kitchen aid. I mixed on low speed for a few seconds just until it was all mixed. Then I added everything else with the exception of the flax seeds, sesame seeds, sunflower seeds and yeast. I mixed that for 2 minutes on medium speed. I added the remaining ingredients and mixed for another 2 minutes while occasionally scraped down the sides. I sprayed a glass bread pan and let it rise in my oven with the oven off but the oven light on. (Although here in Arizona simply leaving it on the counter is sufficient. )I let it rise for 40 minutes. I took it out of the oven and preheated the oven while it continued to rise. I baked it for 35 minutes at 350 degrees. I wish you could taste this!! !” her oven loaf looks fantastic. We might try it this way next time! Thanks for the tips. It’s been awhile since I have made gluten free bread for myself, a refresher is always helpful! You’re very welcome. Hope you enjoy the bread as much as we do!